can be found and explain why the landscape around East Wear Bay looks as it does. Pavilion), Wear Bay Road, Folkestone (TR 239 364). DISTANCE: 1 mile (2 hours). A walk to find out about the recent discovery of dinosaur footprints at Wear Bay beach with a short fossil foray to see how to find fossils on the beach. Donation appreciated. 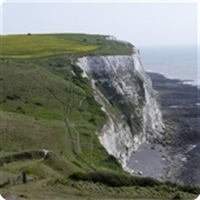 LEADER: Philip Hadland, Geoconservation Kent on behalf of White Cliffs Countryside Partnership (01304 241806). MEET: Outside Sandbanks (The Pavilion), Wear Bay Road, Folkestone CT19 6BL (TR 239 364). DISTANCE: 1 mile (2 hours). GRADE: 5 (rocky shore).